Renovating or remodeling your home is certainly a great idea, not only because it adds value but also it will allow you to enjoy your home even more. Andy OnCall® is your interior and exterior specialist when it comes to home remodeling. We are qualified to remodel every room in your home and the garage too! The remodeling possibilities are limitless and the choices are yours. Do you need more space in your bathroom? Why not add a double sink or a new vanity? Perhaps you’ve always wanted a Jacuzzi or soaker tub? Maybe a double head shower is what you desire? Andy OnCall® can revitalize your bathroom and make it everything you want it to be. Sometimes all you need is a “Bathroom Facelift”. This is a remodel that does not require moving or relocating any walls or fixtures. We usually can replace the tub/shower tile surround, vanity and toilet within a two week time period. This is a perfect refresh that allows you to update your bathroom at a reasonable cost in a short amount of time. If you are unsure what changes you want to make, let us give you professional advice and help you finalize your design choice. Working with our reliable, trustworthy and experienced craftsmen will not only save you from costly repairs down the road, but will also give you peace of mind that the project was completed with quality workmanship. With Andy OnCall® as part of your team, your bathroom refinishing dreams can become a reality. These are becoming increasingly popular due to their high level of convenience and safety. You can choose from various custom options during the planning process: shower door, shampoo dispensers, seat, tiles, showerhead, etc. Whether you want a standard soaking tub or a whirlpool bathtub, relaxing in a fragrant hot tub defines luxury in any bathroom. Your selection will provide not only relaxation, but it can be tailored to your needs with jets, lights, neck rests and heaters of your choice. Simply replacing a vanity can significantly change the tone of a bathroom. There are many options for vanities, including: custom drawers, counter tops, cabinetry, faucets, sinks, mirrors, lighting, and storage racks. 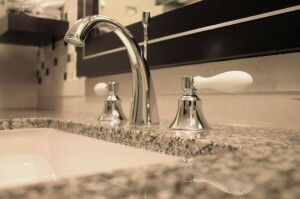 Our bathroom remodeling services include: installation of bathtubs and showers, installation of bathtub liners, installation of toilets, installation of vanities, countertops, sinks and faucets, installation of cabinets, cultured marble, and granite surfaces, installation of shower heads, installation of vinyl, tile, underlayment and other flooring, caulking, grout installation and grout repair, installation of bathroom fans, bathroom lighting, towel bars, medicine cabinets and other fixtures. Andy OnCall® has been creating beautiful bathrooms in Chicago, Evanston, Wilmette and throughout the rest of the North Shore for more than 10 years! Call Andy today and Join the ranks of the many happy and satisfied clients! Call Andy today to turn the Bathroom of your dreams into a reality!